Castelli Romani is an area of small towns southeast of Rome in Italy. The area of the Castelli is volcanic. 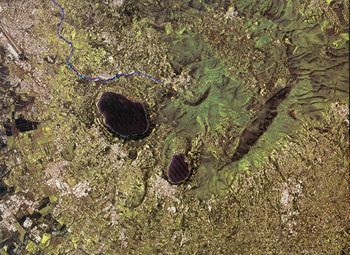 The former crater is occupied by two lakes, Albano and Nemi. As the area’s altitude is higher than that of Rome the richer Romans used to frequent it for its fresher climate during summer. 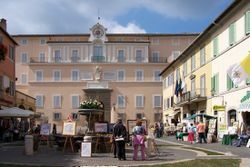 This tradition was followed by the Popes, who still have their summer residence at Castel Gandolfo. The area is well-known for its wine, particularly that of Frascati although with a few honourable exceptions the quality is not too high. Ariccia is celebrated for its porchetta (roasted pork meat), while Nemi is a berry fruit center. A wide range of mushrooms can also be found in the Castelli. The Castelli Romani have a number of small, but interesting, museums. They share a common web site at . Several of the towns of the Castelli are connected with Termini station in Rome. There are two lines: one goes to Frascati while the other connects Rome with Marino, Castel Gandolfo and Albano. The Castelli is also conveniently reached from Ciampino airport (see Rome) now used by a number of the budget airlines like Ryanair . However, you may have trouble finding a taxi willing to take you in the opposite direction to Rome. The area is easily reached by car. Avoid Sundays between April and September as the area becomes crowded. Leave Rome on the Via Appia Nuova or the Via Tuscolana. If you take the Appia turn left at the end of the Ciampino Airport runway and follow the Via dei Laghi (Road of the Lakes). You will pass Marino on your left and eventually find Lake Albano on your right. Beware that several of the higher Castelli towns have narrow winding roads that are difficult to drive in for the inexperienced. There are bus services, but your ability to see all of the Castelli area in one day will be rather limited. Albano owes its importance to the construction of the original Appian Way (see Rome/South) which passed nearby and made it possible for affluent Romans to access the area and build summer villas. Ariccia is close to Lake Nemi. It has become famous for its "porchetta", which is pork that is slowly roasted with herbs and wild fennel. Castel Gandolfo. Summer home to the Popes. Overlooking Lake Albano, which is a popular summer weekend destination for Romans. Frascati. An attractive town with a large number of villas, most notably Villa Aldobrandini which dominates the town. Many places to sample the local white wine. Genzano. 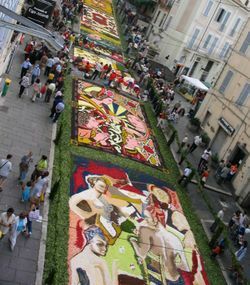 An interesting town but mainly famous for its "Infiorata" on the Sunday and Monday following Corpus Christus. A whole street is covered with carpets of flowers and a masked parade walks on these, with participants in traditional clothes. Each year the flower designs must conform to a previously agreed theme. Marino. This is the closest of the Castelli Romani towns to Rome. Also well-known for its, fairly average, white wine, Marino was an important town under the Romans and has several interesting buildings. It hosts a Grape festival on the first Sunday of October, when some of the fountains spout wine instead of water. Best avoided on that day as it can get very crowded. Somewhat stranger, on the following Sunday Marino holds a Doughnut Festival. 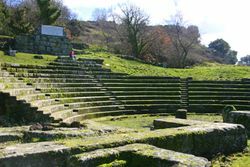 Nemi. Overlooks the lake of the same name. It is an important fruit growing area. The town is dominated by the Ruspoli Castle. At Via Diana 15, there is a small museum of the Roman Navy, which houses reconstructions of two ships of the Emperor Caligula, discovered at the lake in the 1930s and then unfortunately destroyed by fire . Rocca di Papa is an important equestrian center and also famous for its roast chestnuts. Rocca Priora. At 768 meters, the highest town in the Castelli. Tuscolo. Site of the ancient Roman city of Tusculum. Compared with the ruins of Rome little now remains but the setting on a ridge overlooking both the Castelli and Rome is spectacular . Free admission. Guided tours in Italian at 10.00 on Sundays. Velletri is on the southern edge of the Castelli. Inhabited by the Romans from 500 B.C.it is the largest town in the region and allegedly home of the world's first pawnshop in the 15th Century. No real need for predetermined itineraries. If you have a car and a good map (buy a map of Lazio, not of Italy, which won't have enough detail) you can plan your own. A quick driving tour around most of the major towns and other sights can be done in a day. The Old Frascatii Wine Tour, Via Frascati Colonna 25, ☎ +39 328 389 8372, . Tour one of the region’s most unique vineyard Farmhouses and spend an amazing afternoon in the breath taking wine country overlooking Rome. The Old Frascati Wine Tour organizes wine tours, pizza making tours and tavern tours. Located just 12 miles south of Rome in Frascati. 55 Euros. This page was last edited on 12 December 2017, at 02:09.